Melaleuca incana comes from Western Australia and is one of at least 110 species native to this State. Only a few of these species are in general cultivation. Many Western Australian Melaleucas are very attractive plants. There is scope for experimentation to test the suitability of these virtually unknown species in cultivation. We now return to Melaleuca incana, a species is common in cultivation. Known as the Grey Honey-myrtle, this medium shrub has soft, weeping, grey-green foliage. 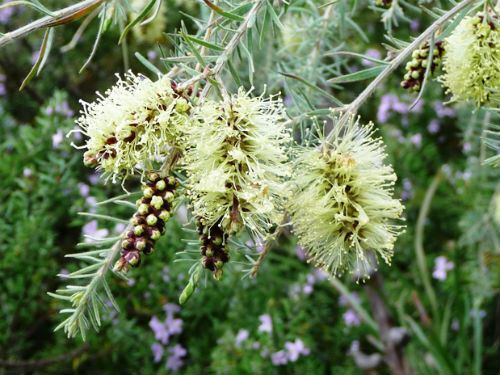 Small bottlebrush-shaped, yellowish-green flowers appear en masse in spring. Melaleuca incana is a triple-headed plant because the growth habit, foliage and flowers are all attractive features. We have many specimens growing in our cold climate garden and the species is popular in other New England (NSW) gardens. Melaleuca incana propagates readily from cuttings. Melaleuca ‘Velvet Cushion’ is a beautiful dwarf cultivar.